Arias, M.; Troncoso, A.; Riquelme, J. In this paper a kernel for time-series data is presented. The main idea of the kernel is that it is designed to recognize as similar time series that may be slightly shifted with one another. Namely, it tries to focus on the shape of the time-series and ignores the fact that the series may not be perfectly aligned. The proposed kernel has been validated on several datasets based on the UCR time-series repository . A comparison with the well-known Dynamic Time Warping (DTW) distance and Euclidean distance shows that the proposed kernel outperforms the Euclidean distance and is competitive with respect to the DTW distance while having a much lower computational cost. Arias, M.; Troncoso, A.; Riquelme, J. 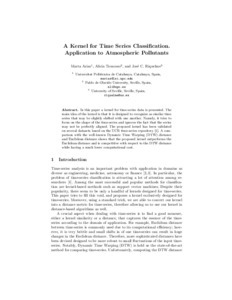 A kernel for time series classification: application to atmospheric pollutants. A: International Conference on Soft Computing Models in Industrial and Environmental Applications. "Advances in Intelligent Systems and Computing". 2012, p. 417-426.